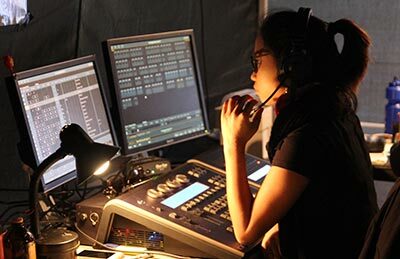 NIDA’s Bachelor of Fine Arts (Technical Theatre and Stage Management) is an immersive, practice-based course that produces successful technical theatre and stage management artists and practitioners. The course focuses on innovative and effective ways to manage and integrate technical fields within theatres, concerts and events. Classes include the theory and practice of stage management, production management, lighting, audio, technical drawing and video for performance. A key feature is the broad range of experience and knowledge students receive to prepare them for leadership roles that require creative, technical and managerial expertise across multiple disciplines. Students also receive practical experience as stage managers, technical managers and technical designers and crew. In their final year, students spend a minimum of 10 weeks in industry placements, where they gain real-world experience that is essential to employability and a sustainable career in the arts. Want to know more about this course? Graham Henstock, Head of Technical Theatre and Stage Management explains. This subject introduces students to the knowledge and skills that underpin proficiency in the Technical Theatre and Stage Management disciplines. Through theoretical and applied sessions that communicate and demonstrate the primary processes, students are introduced to the practices, procedures, history and technologies that exist in the fields of stage management, lighting, audio, technical drawing, staging and multimedia. Students are also exposed to methods for recording, classifying and integrating information in a variety of documentary forms, such as technical drawings, discipline-specific documentation, reference notes and creative journals. Students prove their acquired knowledge and skills through a variety of projects that require them to recall, demonstrate and express the creative, technical and managerial practices, procedures and frameworks they have been introduced to in this subject. This subject deepens student understanding of the knowledge and skills that underpin the disciplines of Technical Theatre and Stage Management. Students are familiarised with the fundamental processes and technologies utilised by Technical Theatre practitioners and are encouraged to integrate these elements into their practice. The primary technologies and procedures of stage management, lighting, audio, technical drawing, staging and multimedia are illustrated and contextualised through both theoretical and applied sessions. Students also refine their methods for recording, classifying and integrating information in a variety of documentary forms, such as technical drawings, discipline-specific documentation, reference notes and creative journals. Students demonstrate their acquired knowledge and skills through a variety of projects that require them to communicate comprehension of creative, technical and managerial roles, methods and procedures, as well as translate that comprehension into practical outcomes. This subject involves an experiential learning process through which students develop, realise and apply their acquired skills and knowledge on large-scale, cross-discipline collaborative projects. Students are assigned a technical theatre support role. Within the scope of that role, they work collaboratively with students from other intakes and disciplines to realise at least one significant performance project. The tasks executed by the students during the performance project emulate those undertaken by technical crew members within a professional live performance environment and involve a comparable level of responsibility and expectation. TSM7102A and TSM7102B Technical Theatre and Stage Management Interdisciplinary Collaboration are run concurrently, with half of a student intake completing each subject in each semester. The tasks executed by the students during the performance project emulate those undertaken by assistant stage managers within a professional live performance environment and involve a comparable level of responsibility and expectation. TSM7102A and TSM7102B Technical Theatre and Stage Management Interdisciplinary Collaboration run concurrently, with half of a student intake completing each subject in each semester. This subject offers a context for understanding the national creative industries landscape by providing an overview of the orientating concepts, history and current composition of Australia’s performing arts markets, institutions and organisations. This content includes detailed information about employment types and trends, customary employment conditions and the industrial relations structures that shape life as a professional within Australia’s creative industries. In addition, the subject introduces students to the personal management skills and techniques that play a critical role in successful creative careers. Amongst these practices are time management, prioritisation, scheduling and adaptability. Linking industrial relations and good work practices, this subject also begins the process of familiarising students with the frameworks, procedures and documentation underpinning effective Workplace Health and Safety. The focus of this subject is on the non-discipline specific skills and knowledge students will require for forging successful careers. The subject interweaves training in basic financial management procedures and techniques with the fundamentals of working with spreadsheet software. Furthermore, the subject emphasises the managerial and interpersonal skills that are essential within the technical theatre and stage management disciplines. As a means of imparting this knowledge and these skills, the subject concentrates specifically on effectual communication, processes of negotiation, conflict resolution techniques and modes of successful leadership. Through these topics, students will learn effective systems and practices that can be applied to the leadership and communication challenges that arise within creative industries. Students are introduced to complex processes and technologies utilised by Technical Theatre and Stage Management practitioners. They explore the ways in which their growing understanding and aptitude in these fields can be used to identify, interrogate and resolve creative, technical and managerial challenges. Through a combination of theoretical and applied sessions, students investigate, test, analyse and clarify stage management, lighting, audio, technical drawing, staging and multimedia processes, practices and procedures. Students improve and extend their methods for notating, categorising and presenting information in an array of documentary forms, through the generation of detailed technical drawings, comprehensive discipline-specific documentation, reference notes and creative journals. The students’ ability to synthesise and adapt their acquired knowledge and skill is tested through a variety of projects that require them to demonstrate thorough comprehension and translate that understanding into efficient and effective practice. Students are immersed in the complex vocabularies, processes and technologies and utilise their growing expertise in these fields to develop strategies and processes for managing and leading creative and technical teams. Students are encouraged to explore and refine their artistic and professional identities, processes and passions, as well as position themselves as independent artists, valuable collaborators and industry leaders. Although theoretical sessions occur, there is a significant focus on the application, integration and demonstration of stage management, lighting, audio, technical drawing, staging and multimedia systems, practices and procedures. Students hone their methods for notating, organising and communicating information across various documentary forms, including intricate technical drawings, specialised discipline-specific documentation, reference notes, creative journals and reflective diaries. The depth and quality of the students’ knowledge and skill is confirmed through projects that require them to translate and evolve their comprehension into innovative and adroit practice. This subject involves an experiential learning process through which students develop, realise and apply their acquired skills and knowledge on large-scale, cross-discipline collaborative projects. Students are assigned a stage management role within the scope of which they work collaboratively with students from other intakes and disciplines to realise at least one significant performance project. Students are assigned a technical theatre supervisory role. Within the scope of that role, they work collaboratively with students from other intakes and disciplines to realise at least one significant performance project. The tasks executed by the students during the performance project emulate those undertaken by technical theatre supervisors or system designers within a professional live performance environment and involve a comparable level of responsibility and expectation. TSM7202A and TSM202B Technical Theatre and Stage Management Interdisciplinary Collaboration run concurrently, with half of a student intake completing each subject in each semester. The tasks executed by the students during the performance project emulate those undertaken by stage managers or deputy stage managers within a professional live performance environment and involve a comparable level of responsibility and expectation. This subject is designed to prepare students for their future careers as self-generating artists and professionals. In order to achieve that goal, the subject delivers knowledge and skills related to two specific topics – Professional Profile Management and Independent Business skills. The topic of Professional Profile Management provides instruction in how to effectively create, manage and market a professional identity, including training in the preparation of portfolios and résumés, job interview techniques and the online management of professional reputations and personas. In regards to independent business skills, the subject covers the processes that must be followed when setting up an operational entity, as well as the basics of seeking funding, business taxation and the roles and responsibilities of employers and employees. Running parallel to both topics is ongoing learning about the frameworks, processes and documentation that contribute to operational Workplace Health and Safety. The intention of this subject is to extend students’ understanding of national and international creative industries and contexts, whilst also solidifying the non-discipline specific knowledge and skills utilised in business, financial and project management environments. Throughout the subject there is a focus on the legislative and regulatory conditions that apply to creative industries, especially those that relate to copyright, privacy, commercial contracts, importation and exportation, international employment, industry specific taxation and workplace health and safety. This content is contextualised by an ongoing analysis of the key organisations, institutions and individuals that influence and operate within arts and entertainment fields and couched in terms of good governance practices for business planning, project management and grant acquittal. In addition, students continue to explore and refine their business, financial and project management techniques through the development of complex interlaced project plans, schedules and budgets. peer review, and document the outcome of the peer review process after final presentations of the work. In the final year the course focuses in depth on practical work at NIDA, in which each student is expected to display professional skills closely related to professional practice, and includes an extended period of observation and professional practice working with arts and entertainment industry-based companies or practitioners. Students are presented with complex hypothetical scenarios that include multilayered creative, technical and managerial challenges. The students draw upon their acquired knowledge and skill to formulate, research and develop strategies, processes and procedures for managing and overcoming the challenges present within the scenarios. Student learning and engagement during this subject is predominately self-directed, although some supplementary resources and teaching sessions will be delivered in a blended-learning format. In addition, students will have direct access to an assigned supervisor or mentor for added support and guidance. Students finesse their ability to document and communicate complex concepts and practices through the generation of detailed project briefs, planning documents, technical drawings, creative journals and reflective diaries. Student progress is evaluated through the presentation of an interim report that demonstrates specific hypotheses, as well as the research and planning that has been done. With reference to the scenarios provided within the previous subject, students continue to research and develop, and then realise and test, strategies, processes and procedures for managing and overcoming multi-layered creative, technical and managerial challenges. This process culminates in a written submission that includes documentation of research methods, plus evidence of any practical demonstrations of concept. Through this submission, students will supply confirmation of the testing of their hypotheses, as well as the results of that testing, valid or otherwise. Students refine their ability to document, communicate and evaluate complex concepts and practices through the generation of detailed project briefs, planning records, technical drawings, discipline-specific documentation, reference notes, creative journals and reflective diaries. Assessment of student capacity to translate acquired skill and knowledge into reflective practice is achieved through evaluation of the documentation and practical realisation of strategies, processes and procedures. 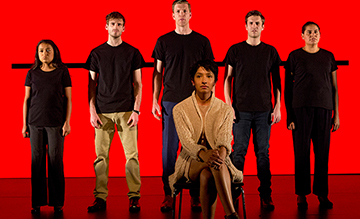 Within this subject students are assigned a technical theatre design role. Within the scope of that role, they work collaboratively with students from other years and disciplines to realise at least one significant performance project. The tasks executed by the students during the performance project emulate those undertaken by lighting, audio or multimedia designers within a professional live performance environment and involve a comparable level of responsibility and expectation. TSM7302A and TSM7302B Technical Theatre and Stage Management Interdisciplinary Collaboration run concurrently, with half of a student intake completing each subject in each semester. Students are assigned a senior management role. Within the scope of that role, they work collaboratively with students from other intakes and disciplines to realise at least one significant performance project. 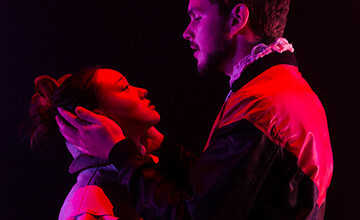 The tasks executed by the students during the performance project emulate those that might be undertaken by production managers, senior stage managers, company managers, technical managers or event managers within a professional live performance environment and involve a comparable level of responsibility and expectation. TSM7303A and TSM7303B Technical Theatre and Stage Management Professional Practice are synergistic subjects that seek to introduce and integrate students into professional industries, networks and communities. In this semester, students are involved a process of formalised collaboration between NIDA and the professional industries, through which students engage in a significant work integrated learning experiences. During the semester, students spend a minimum of five weeks working with at least one industry partner, receiving direct experience of the practices, processes and environments of professional industry. Student performance and progress is assessed through a process that incorporates the observations and feedback of industry collaborators and professional mentors, as well as a self-reflective element, through which the students document, analyse and synthesise their experiences. In this semester, students continues a process of formalised collaboration between NIDA and the professional industries, through which students engage in a significant work integrated learning experiences. During the semester, students spend a minimum of five weeks working with at least one industry partner, receiving direct experience of the practices, processes and environments of professional industry. This experience deepens and expands student understanding of professional practices and standards. Student performance and progress is assessed through a process that incorporates the observations and feedback of industry collaborators and professional mentors, as well as a self-reflective element, through which the student documents, analyses and synthesises their experiences. You will not need to purchase all the equipment prior to commencing the course. However you should be prepared to buy the equipment as you need it through the year. Some of the equipment is expensive and fragile, take care of it and it will last many years. The brand names of tools are recommendations only: Stanley, Sidchrome, and Staedtler are considered reliable brands. You can buy drafting items yourself or take advantage of a NIDA package deal with Draftex to supply these items as a drafting kit at a discounted price. If you are interested in this deal, speak to your Theatre Drafting tutors early in the first semester. It is recommended that you not purchase this equipment until after your first drafting class. You will not need to purchase headphones immediately so if these are too expensive for your budget you should consult your Sound Tutors about more economical options. Shortly after arriving at NIDA you will be required to have a set of black clothes (i.e. long sleeved black top, with no visible logos/designs and long black trousers) and black shoes for production work. All black clothes should be neat and presentable. You should also have sturdy, protective footwear for working in workshops and theatres; rubber-soled work boots (Blundstones, Redbacks or similar), hiking boots with leather uppers, or something similar (steel caps recommended but not compulsory). Steel toed Dunlop Volleys are NOT recommended. Your boots should have good ankle support, and you may wish to consider investing in a pair of cushioned inner soles. Canvas slippers, open toed shoes and sandals are not suitable footware for workshops or the theatres. N.B. Safe working footware and clothing is compulsory when in the workshop area. Entry to the BFA Technical Theatre and Stage Management is by interview. Applicants will need to prepare a project prior to their interview - see below for details or download the BFA Application Guide for 2019. You may upload a digital portfolio with your application; otherwise you can bring one with you to your interview. You should prepare examples of past work that you feel will support your application and demonstrate your suitability for a career in the arts and entertainment industry. The purpose of the portfolio if to provide an insight into how you think as a practitioner. Prepare your project according to the requirements and bring it along to your interview for discussion. First, there will be a brief talk about NIDA, the Technical Theatre and Stage Management course and what will happen during the interview. There will be an opportunity for you to ask any questions you may have about NIDA or about the interview itself. Each applicant will then be interviewed for around 45 minutes. During the interview, we will discuss your project; your ideas about theatre, film and the broader creative industry; and why you want to study Technical Theatre and Stage Management at NIDA. Come with a clear idea of why you want to study Technical Theatre and Stage Management at NIDA. Once you have chosen a production from the list, you must prepare a creative project that demonstrates how you would stage your production within the nominated theatre plans (see below for a plan and section of the theatre). You must use a 1:50 scale. Your ground plan can be hand-drawn or computer generated. You must use the attached plan and section of the theatre as the basis for your drawing. Whilst some elements of your production may be presented in “sketch form”, at least one technical element (the set design, lighting design, audio design or video design) must be thoroughly investigated. This investigation should be demonstrated through appropriate references and documentation. How performers will move around on your set – particularly entrances and exits. The practical and creative motivation behind your design decisions. The physical characteristics of your set. How you will manage any safety considerations for your cast and crew. How any set pieces or props will move on, off or around the stage. How you will achieve any scene changes. List three theatrical performances you have seen and write a review of one of them. Your review should be a minimum of 300 words. Rather than writing a synopsis of the production, please provide a personal response to the production. Describe how the technical elements of the production supported the narrative. Download the theatre design documents you will need for your project here. Technical Theatre and Stage Management students learn creative, technical and managerial expertise across multiple technical fields. As a graduate of the Bachelor of Fine Arts (Technical Theatre and Stage Management) you will have the necessary skills and knowledge required to succeed across the multidisciplinary field of production. Read more about Graham Henstock, director of NIDA's Centre for Technology, Production and Management. 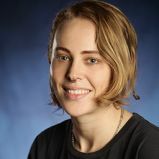 Prior to NIDA, Jessie undertook a combined Bachelor of Arts Theory/Art degree at University of New South Wales, with a particular interest in avant-garde film and modernist performance practices.